I have 2 questions, basically I'm going to soon mod my case side panel possibly with 1 or 2 120mm case fans. My first question is what fans should I use, my goal is silence. Here are a few examples I have gone around finding the best fans from what I have heard and putting the info together. 2) My second question I was wondering if I could be pointed to other supplies I will need for this mod, examples: Fan Grill // Fan Filters // and anything else I might need, or need to know. And any recommendations would also be appreciated. This 120mm fan is one of the best I've used. I also second the use of 120mm hole saw. Much faster, easier and cleaner cut. But it can be done with a dremel tool as well. Fan noise evaluation is highly subjective. You might be able to tolerate a rumble, but a ticking will drive you insane, or vice versa. Fan noise ratings are full of specmanship. SilenX fans have their noise measured using a non-standard method. Arctic cooling rates its fans in Sones instead of dB. Put these two facts together and just resign yourself to the likelihood that after all the reviews and recommendations you're probably going to buy a fan or two more than you actually use. As for cutting the hole I recommend you try reversible alternatives first. Clean up your cables. Build some ducting out of cardboard to bring outside air directly to the spot you want to cool. If that doesn't work then start hacking holes in your case. Grills are cheap, use them unless the fan is completely inside your case. Fan filters cut the air flow slightly, but also cut dust build up inside your case. They're also cheap and can be removed if you really need that last 0.1 CFM of airflow. Also consider silicone fan gaskets, they too are cheap and removable. Fan controllers are not as cheap as cheap as grills or gaskets, but they do help lower the noise. That is also what im trying to decide where to put the hole's and how to get it exactly where I want it considering I dont have a sidepanel window to see where I'm doing it. Im using a Sonata 2 Case. My first question is could someone draw me up a example on where you think I should put my hole or hole's. Ill post a pic. And second could you guys gimme some link from like lowes or homedepot or something available locally probably. Is this what I need to get? I would just like other links so I can buy them locally. And anything else I might need or try post a link please. Picture of case for an idea of where to put them, im either guessing 3 locations. Mainly just need #1 or 2 for now, 1 hole at a time incase i dont do the second one. Why do you want the side panel fans? If your goal is to silence your computer then adding fans will not help. Replacing fans, moving fans and changing heatsinks will help silence your computer. Adding fans adds noise (more or less depending on the fans). Do you want something to be cooler than it is? What do you want to cool: CPU, GPU, Northbridge? Or do you just have an itchy Dremel-finger? I also have the Sonata 2 case and have been thinking about modding it to have a side intake fan. I was debating on adding a window with a fan or 2 or just cutting into the side of the case. Right now I have replace my hsf with a zalman 7700cu and my video card is cooled with an arctic cooling hsf. Also added an AeroCool fan for the exhaust and moved the stock fan to the front intake. After all that, I am kind of happy with the cooling, but I think it could be better. I am pretty sure that the intake on the case is limited since the stock fan I moved up front is behind the hard drives (I have 4) and there is a filter on the front AND the front of the case has a plastic piece over the filter (air has to go around the plastic to get to the filter). Also, the case comes with an intake duct that takes air from the back of the case and dumps it onto the CPU. I ended up removing this duct cause it hindered the front -> back airflow of my case a lot. That being said, there are 2 locations in the duct to mount fans (92mm I think) over the gpu and cpu. This would probably help too. Either way, by far the loudest fan in my case was my GPU fan (sapphire ati x850xt). It was not only loud, but made an irritating kind of vibarting hum. I didn't want to mess with it at first (since it voids the warrentee), but eventually I got pissed off enough and replaced it with my Arctic Cooling Rev 5 (or something) and it lowered the temps by 10 degrees at load and it vastly quieter (nearly inaudible even at 100%). So if you want cooling, there are many options with that case. What part(s) of your system is running hot? I guess you don't use the duct, but if your CPU is hot, it might help. If your front intake fan is better than the stock rear one, you could try swapping them (exhaust should be > intake). Also, the stock fan has a fan controller, is it set on the highest setting? K, I guess I forgot to state my main reason for wanting to put a side panel fan. There's only so much cable management can do, and iv'e pretty much fixed them the best I can, and a little bit more isn't gonna add but maybe -1C. So my reason is to cool down my CPU. So back to my post before this, can anyone post some links, and any other info I may need..
Also, you should move your hard drives down to stop them from blocking the intake to the fan. Right now it looks like your lower HD could be blocking the air from getting to the intake and end up just recirculating the air. Firstly both my case fans are Antec TriCool fans so can't move them around there the exact same. And everything in my case fan wise is on max. I might try your HD idea on moving them down. Also about that Window Kit few things I dont get about it, it doesn't say anything about working with Antec Sonata 2 case. I also dont see how it attaches to the case, and I also dont think it would help me out much for the hole being at the bottom and I need it at the top for my CPU. But I dont know much about them so maybe you can explain it a little bit more, possibly im missing something. Thanks for everyone's help, I appreciate your comments, I'll be back in about 4-6 hours looking forward to reading some replies. So you want to get better cooling on your CPU. I understand the D-805s tend to just run hot, so adjust your expectations accordingly. You want to run more air or cooler air (or more and cooler) through your heatsink. More is hard to get, you have to replace the heat sink fan. Cooler you can do by adding a side vent, but you don't need a fan in it. Here's a test to try that's nearly free and reversible. Pop open your unused 5 1/4" bay. Make a cardboard air duct from the front of your case to the CPU fan. (It make take a little effort with scissors and tape, but it'll be easier than cutting your case.) See how much that lowers the temp on your CPU. I also respectfully disagree that you have reached the limits of cable management. Those Antec fans, at least on high speed, seem to push a decent amount of air. I have found that my AeroCool (turbine something or other) pushes quite a bit more air and I don't think its any louder. The window kit I am not 100% certain that it works for the Sonata 2 case. It says that its made for the Chenming case and that it is also sold as an Antec (somewhere on that site, can't remember where). I also wanted a hole above the cpu instead of the GPU area, which is where it looks like the hole on the window is (unless you could flip it around?). I was thinking I could mount a fan below the GPU (some really quiet one) and then cut a hole for the other one above the CPU. Does anybody know where you can buy a tool to cut a 120mm hole? Do I need to buy a dremel and a bit for it? Was the bit in that link above for cutting metal? I dont really understand how the whole cardboard thing works, and how to make it go to the HSF. Would you beable to show me a picture of how it should be built and attached.. I also would like you to look at my case picture above, considering you say I can do more basically, and if you could tell me what to do exactly, my case pretty much looks the same except now I have a TV Tuner Card in the middle PCI slot. Very much appreciated if you could. And I will give them both a try. I beleive that link I posted to see if that will beable to make my hole for me will cut threw medal. And its used with a electric screwdriver I beleive, not a dremel. on the affected fan thus stressing the electric motor. and fan helps vibration and noise a little. Here is a good example of the cardboard thing. pretty good link. storm you should check it out. I will try to do my best verbally here. What you want to do is bring the coldest possible air directly to the CPU fan. From what I see in your picture the bottom 5 1/4" bay is unoccupied. Pop out the front panel inset for this bay. You probably will have to pop out some case cutout as well, but it wasn't adding any serious strength to your case, and the front plastic insert will cover the hole if this doesn't work. Now get some scissors, tape and cardboard (cereal boxes are a good choice). Build a duct from your front panel 5 1/4" bay opening to the front of your CPU fan. This will be a little tricky as you are starting with a rectangular opening and ending with a circular outlet. Since you don't have a window looks don't really matter here, and you can use lots of tape. Do not tape the duct to the CPU heat sink as the adhesive will gum up the fins and cut its thermal characteristics. There all also areas of your case where you want LESS airflow. The bottom of you case towards the back has very few components and they don't generate much heat at all. Put a little cardboard box, or chunk of packing foam here. Don't cover the North or Southbridge chips and leave some room for air to get around the TV tuner card. This will make your inlet air tend to flow around the components that need it most. As gm0n3y suggested move your hard drives so that inlet fan has more unrestricted airflow. This is a mixed blessing as your drives will get a little warmer, but I'm guessing these are not really hot 15,000 RPM monsters. With a little effort (and maybe some tape) you can get the mobo power cable out of the way too. Good luck, and if this doesn't do any good then you can still go and buy power tools. Oh and also, what do I use to clean it up after, for like sanding it down wise..? Other then sandpaper...? The problem with the air duct idea above is that the Sonata 2 case has a front door on it, so the door would have to remain open for this to work. 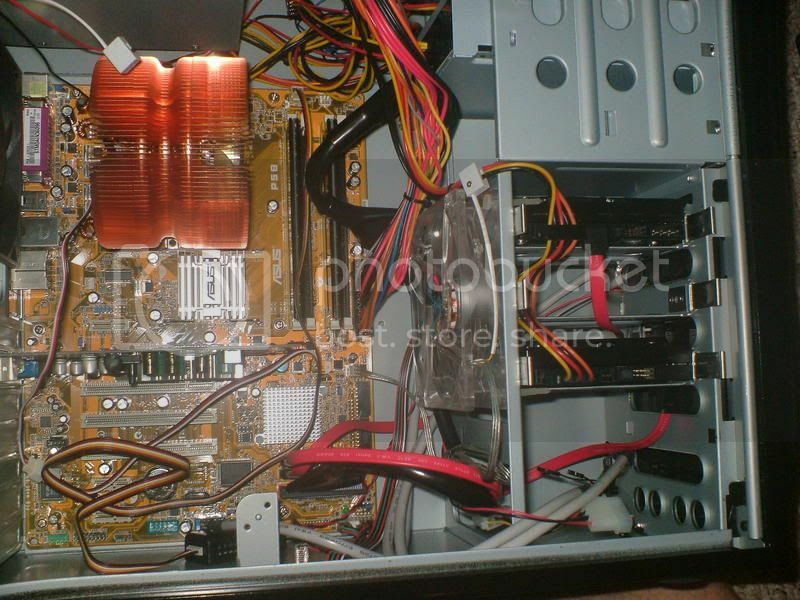 The original duct that came with the case took air from the lower back corner of the case and routed it up to the CPU. This would work well, but the duct has some corners and impedes airflow to the rest of the case. You could try putting that duct back in and compare your temps. In my case (pun intended) I was also worried about GPU heat, so it was best to take it out (or install duct fans as mentioned above). That link to the cable folding example is pretty sweet. Somebody posted that in another thread about a week ago and I think when I get my new PSU next week, I will redo my IDE cable folding it like that (I will probably have to use a new one though, my old one is pretty bent up already). That cardboard duct idea is quite neat. I haven't seen that before and it seems to work quite well. I think if you paired that up with some ducting, you would get vastly better cooling results. The only issue that I have with this is that the case, while beautiful (IMO), looks pretty ugly with the door open. Crap, I forgot that the Sonata 2 has that Antec PSU with front air intake. That kind of rules out the last suggestion of mine. Not always true. Sometimes you can significantly up your case flow while simultaneously lowering the SPL by doing exactly what the OP is proposing - add quiet fans. On my game box, I added a second 12cm in front and an 8cm in the door and the SPL at the ear in the keyboard position went down by over 3 dB. The main reson is that the improved airflow caused the chipset fan to throttle down from 7000 rpm to ~3500 rpm and it was the single loudest noise source. Having a large vent surface with slow quiet fans is not a bad idea. To the OP: I've got quite a bit of experience comparing SilenX, Scythe and Nexus fans. If you go with low rpm fans, all will cut your noise measurably. To my ears and dB meter, SilenX is the quietest. I'm fiddling with the Yate Loons now and don't have enough data to conclude yet. Good value though. The real key is to figure out if you have one or two major noise sources, then decide what to do about them. After reading some, I noticed some are willing to cut a hole on the side. So, all you need to do is cut the pane for the window. Window dimensions are 12" x 12" - leave an extra 1/2" edge around the window to fit the case. The problem with generic window kits is that the Sonata 2 has a handle around the CPU/GPU area so the area that you would want to mount the window doesn't work unless it is a window designed for the case. Well.. the only other thing you could do with it, is to cut it down, so you wouldn't have to make the 120mm holes, that is if your really good at cutting plexi glass, to shape it to the case needs. However, it would be nice to be able to find things for certain PC cases. I'm loving all the ideas, thanks very much. I will point one thing out, I will be doing 2 other computer cases before I do this one my main one. First one of the cases I'll be expanding from a 80mm hole to a 120mm hole so that should be interesting. Second the other case Ill be doing the whole thing from scratch no previous hole. So the good thing about this is I will have some experience *if I cut into my case. Ill probably start mainly over the weekend, how do you guys think I should go about expanding a alrdy made 80mm side panel hole to a 120mm hole? And a random question, what is VRM baffle? And where can it be baught? Question Can I add more nodes for the fan curve in Wattman? fans being fought over by iCue, msi mobo, and afterburner, i have no say in the end. Fans for overclocking a GPU? Can you overclock a GTX 1060 6GB?